Yes, there was an earthquake in Virginia today. Yes, I'm fine. No, there wasn't any damage. 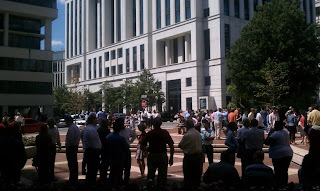 I was walking back from lunch and did a duck-and-cover because I thought there had been a gas explosion in the building next to me. Police came out of the station across the street and asked me if I had felt anything outside. Otherwise, life returned to normal in less than an hour. 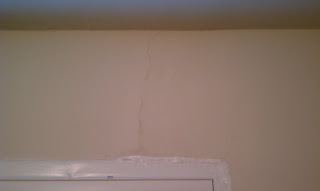 My apartment only sustained minor damage. 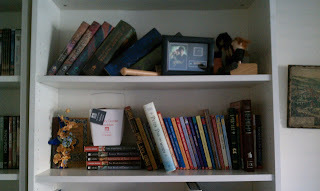 There were a few cracked walls (this is the worst of them) and my books got a good jostling (my Harry Potter shelf most of all), but nothing too major. Thank heaven no one was hurt and there was no major damage anywhere in the city. With such a dense population, the potential for disaster...well, I'm glad I don't have to think about that. Want a good book for kids about earthquakes? Try DK Eyewitness Books' Volcano & Earthquake.